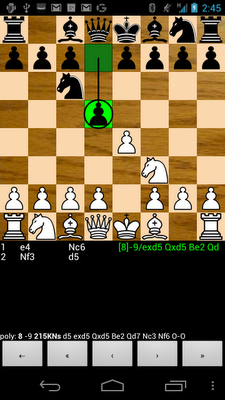 I just released version 4.1 of Chess for Android, available at Google Play or as direct download (including a version with network/SMS permissions). The new features include: Ability to send SMS messages (PGN, FEN, UNICODE, engine analysis)Ability to enable/disable built-in book (useful when imported engine book should be preferred)Larger engine analysis fontFurther localization and internationalization To send an SMS, long-press the notation window, and select "Send SMS", which pops up the window shown below. 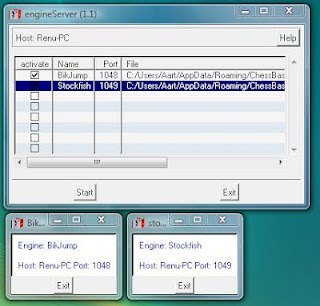 Simply fill out the phone number (which will be remembered for next time), and select between PGN, FEN, or UNICODE format (or engine analysis of an imported engine). Pressing the "Send SMS" button will send the text message. The concise FEN format will be useful for correspondence players, since it can be directly copied and pasted by the other player (I have not implemented an SMS listener yet). Like many others, I learned Basic and 6510 machine code on the Commodore 64, a present from my dear grandfather and parents. Although nowadays one can relive the good old times with emulators, such as CCS64 or Vice, and a cross-assembler, like my own win2c64, nothing beats the real deal! 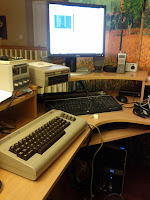 Today I tried to get my old Commodore 64 and 1541 disk drive, bought in Europa, running again. A few 110-220V adapters, a S-Video cable, and some PAL/NTSC settings later, I have my old friend running again. What made me extra happy is that the 1541 could still read the 5¼" floppy disks with my old programs that I wrote back in the eighties, such as the music editor on the screen shot. I am going to try to copy those onto my hard disk, so others can run these in an emulator. My quest for deeper perft numbers for 8x8 checkers using has reached depth 28. Below you see the perft(28) breakdown per move, called "divide". As stated before, the numbers were computed on a cluster of machines, optimized with a "hard collision"-free transposition table as well as bulk counting. The move generator does not eliminate duplicate captures. At this point, the limits of 64-bit unsigned integers have been reached. Although there are obvious ways around these restrictions, this seems a very good time to give this (by now probably insane) project a rest. I have updated this OEIS entry up to depth 26, and may add the higher depths also when I am a bit more comfortable with these most recent results. 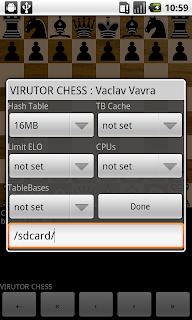 With the new improvements in place, it would almost be a waste not to go deeper with my perft for checkers computation. Therefore, I computed perft(27) from the initial position of 8x8 checkers. Below you see the perft breakdown per move, called "divide". 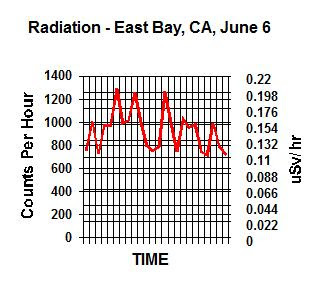 As stated before, these numbers were computed on a cluster of machines, further optimized with a "hard collision"-free transposition table as well as bulk counting. The move generator does not eliminate duplicate captures. I made some improvements to my distributed implementation for computing perft and divide numbers for 8x8 checkers, and now computed depth 26 from the initial position, shown below. As reported earlier, the numbers were computed on a cluster of machines, further optimized with a "hard collision"-free transposition table as well as bulk counting. The move generator does not eliminate duplicate captures (viz. 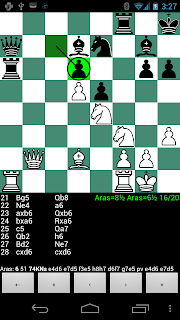 the situation where a king can capture the same pieces in different directions; a situation that starts to occur at depth 12 and up). Continuing my quest for deeper and deeper perft numbers for 8x8 checkers, I now computed depth 25 with the same distributed implementation I used earlier for depths up to 24. Below you see the perft breakdown per move (called "divide") from the initial position for depths 23, 24 and 25 (my depth 23 and 24 numbers were recently kindly confirmed by Murray Cash at the World Draughts Forum). 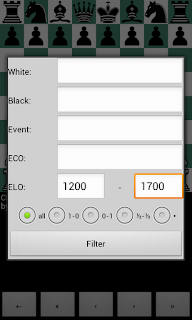 I just released version 4.0.5 of Chess for Android, available through Google Play or as direct download. This release mainly extends localization to more languages, but it also provides a new feature: copying the engine analysis to the clipboard. The following languages are now supported: Afrikaans (af)Chinese (zh)Czech (cs) Dutch (nl)English (en)French (fr)German (de)Hebrew (iw)Hindi (hi) [coming soon]Icelandic (is) [coming soon]Italian (it)Polish (pl)Portuguese (pt-br)Russian (ru)Spanish (es)Swedish (sv)Turkish (tr) Many thanks to my translation team: Vinícius Angiolucci, Lucas Braesch, A.N. Bürümcekci, Panna Chowdhury, Anton Hansson, Arnar Mar Hrafnkelsson, Michal Kaczmarek, Dara Koper, Morgan Lombard, Krizia Lopez, Dennis Prochko, Martin Sedlák, Philip Stutz, Haran Talmon, Ted Wong, and last but certainly not least C.R. Zamana! 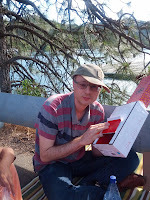 We made a road trip to Mount Shasta and back to view the solar eclipse 2012, Armed with a home-made pinhole camera made by two shoe boxes, we watched the eclipse in a safe way. 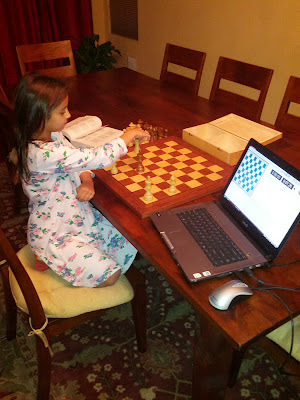 Bob Newell's The Checker Maven is a very interesting online publication on Checkers and Draughts. 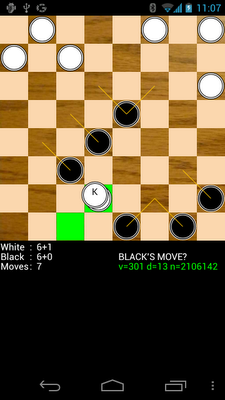 This week's issue features checkers applications for Android. Bob looked at many checkers programs but concluded that the only two application that merit consideration are Checkers Tutor, by world class checker programmer Martin Fierz (author of CheckerBoard and the Cake computer engine), and .... Checkers for Android by yours truly! I am honored to receive this special mention by The Checker Maven. You can find the summary article at the main page. A more elaborate overview, including interviews with Martin and myself and be found in the full article. Many thanks to Bob for posting this article. 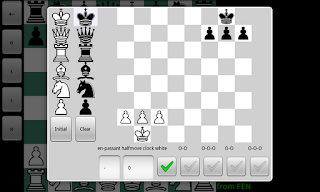 simple animation of captured piecesadded a slight delay in single-move responseadded transposition table to enginemore time controls The new animation and delay will hopefully make it more clear what move was just played. The transposition table should improve the engine strength a bit. UPDATE: version 2.5.1 improves the animation as shrinking pieces (some users thought the older fading pieces were "drag delay"! 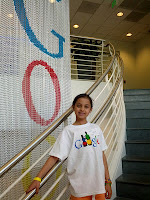 ), adds more endgame knowledge, and shows kings more clearly.